While many picture books take complex ideas and simplify them for kids, this book takes a simple idea and fills it with elaborate detail. Casually bringing up petticoats and cummerbunds, it is one of the least condescending picture books I have read. It also reminds me how lucky I am that I can work in my pajamas! 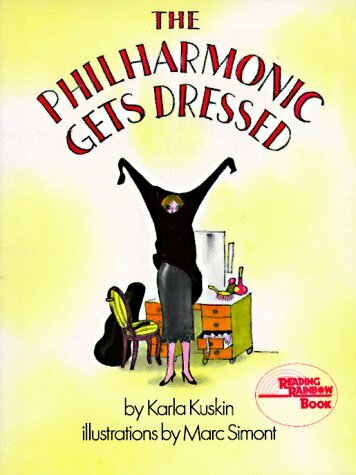 This Perfect Picture Book Friday, I would like to celebrate The Philharmonic Gets Dressed. Opening and Synopsis: “It is almost Friday night. Outside, the dark is getting darker and the cold is getting colder. Inside, lights are coming on in houses and apartment buildings. And here and there, uptown and downtown and across the bridges of the city, one hundred and five people are getting dressed to go to work.” After elaborate processes of clothing themselves, these hundred and five go to work – to the Philharmonic Hall where their job is to create beautiful music together. Why I like it: As I mentioned before, this book delights in the rich details of a simple topic. The author is able to celebrate diversity just by showing how much people can vary in the standard routine of getting dressed, and she reminds us that people who do extraordinary things are still ordinary people who bathe and wear undergarments. And let’s be honest – who doesn’t enjoy reading about brassieres and long johns? Related Activities: The Philharmonic Gets Dressed fits right in to a clothing unit, or offers a great opportunity to discuss daily routines. -Clothing Relay: This is one of my favorites. One team member races to put on an item from a pile of clothes, runs back to his or her team, passes it on to the next teammate to wear, and then that person has to put on an additional piece of clothing from the pile. The last team member will have on as many clothing items as there are teammates. You can find more book recommendations from all kinds of bloggers and readers and add your own at http://susannahill.blogspot.com/. Thanks, Susanna, for the chance to share one of my favorites! This sounds so clever! I love the idea of extraordinary people doing everyday things. One of my favorites! Love the idea to create paper dolls/muscians too. This sounds totally brilliant. What a thoroughly unique idea for a picture book. Love the illustrations here (especially the wool socks). Wow, this one sounds fascinating. The illustrations seem like the kind you can find new things in each time you read it. Thanks for the recommendation, Laura! This book sounds excellent! Love the idea of teaching kids that such people are human, too. I never quite understood that, never quite believed that famous people were regular ordinary people who did all the same things as I did. I suspect I’m not the only child who thought that way. Excellent activities, too. Thanks! What a great book. I love the philharmonic and it is great to find a book for kids. Thanks for sharing. Like your resources. What a wonderful book for feeding a child’s natural curiosity about everything. I wonder if I can parlay this into fewer battles over getting dressed. Hmmmm. This looks like a really good story! I will check it out. Looks like a fun book — story and illustrations. And, it’s in my son’s age range. I’ve never heard of it. I looked it up – a 1982 book. I have this thing for knowing when books were published. Sounds fun. I’d use it in a music unit. I love the relay race idea. One of my all time favorite picture books, too. Sad news about Simont today. Hope you don’t mind, I linked to one of your blog images via Twitter in a post about him. Thanks for the thoughtful post! I hadn’t actually heard yet – that is sad news. Thank you for sharing it, Melissa.